Let’s talk about when we need to start paying the true believers working for our startup. With actual dollars. I’m going to be nuanced on this one because I used to do something similar. In fact, it’s pretty common. At the very beginning of the startup cycle, unless the founder is independently wealthy or incredibly risk-tolerant or enviably well-connected, there’s no money and no one is getting paid. It’s very difficult and time consuming to get an idea into reality on one’s own. It takes a broad skill set, a lot of iterative work, and a bunch of lucky breaks for one person to create a minimum viable product, validate it, and start generating revenue from it. Invariably, that single individual will need help, and if there’s no money and no access to it, they will need an alternative means of remuneration. That alternative is usually promises. And promises in startup are always, always a bridge built to burn. Yesterday, I got an email via my website from “Chad,” a founder working on a new startup with volunteers for staff. He admits straight up that the lack of pay is due to his own lack of funds, but he’s looking forward to paying them all a salary as soon as possible. The problem is, as Chad puts it, their productivity has fallen off despite the promise of wages down the road. He puts this on himself and his lack of leadership. What does he do? Oof. Chad. Buddy. I think you skipped a bunch of steps. We founders need to understand that nothing in startup comes without a cost. Nothing. I went to great lengths a few weeks ago to drive this point home and put some quantification around it with a post called You Need $250,000 To Start a Company. I had detractors, of course, but I stand behind my point 100%. No matter how we pay for it — with sweat equity, paper equity, time, cash, or opportunity cost — we’re going to end up spending the equivalent of about a quarter-million to turn an idea into something that can sustain itself. Even if those costs are hidden or, more to the point, obfuscated. Yeah, if we’re making promises to volunteers, all we’re doing is slyly shifting some of our costs to them and/or the future. So the first question a founder needs to ask themselves is this: If we’re not willing to raise, find, beg, borrow, or steal cash to pay other people to turn our idea into a reality, then how much do we believe in our idea? If the answer is still “very much,” then let’s cautiously look at those alternatives. Problem #1: The founder hands out too much equity to employees too early, leaving very little for investors to purchase with real money. Problem #2: The founder doesn’t vest the employee equity, meaning the employees own a chunk of the company on their first day, even if they leave or get arrested or harass someone. Problem #3: The founder hands out 1,000 or 1,000,000 shares and nobody knows what that means, including the founder. All these problems start with the founder not properly valuing the equity from the beginning. Make your own jokes about how much early stage startup equity is worth in relation to the paper it isn’t even printed on anymore. The fact is the reverse is always true. When we use equity as compensation, we’re selling the future of the company and we’re painting ourselves into a corner in terms of both dollars and time. Always decide how much the future value of those options is worth, always vest them over three years, and always explain to the employee what percentage of the company they’re getting and where we think the value will be at the end of the vesting period. Also, we shouldn’t expect an employee to put in $250,000 worth of work for $250,000 worth of equity. They’d be an idiot if they did that. We’re looking at a ratio, could be 10 to 1, could be 100 to 1, and this is where the next factor comes into play. 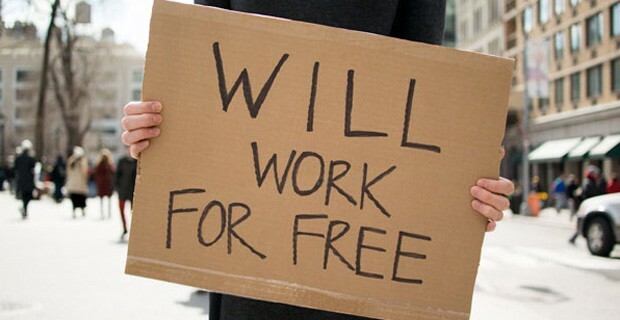 When we ask people to work for free, we’re really just spending passion to pay for risk. People will go to great lengths to help something succeed that they’re passionate about. This is the true root of volunteerism. If we believe in something, we’ll do just about anything for it. Ideas have no value on their own. They are simply a means to an end. The best idea is world peace. I believe in that. I’m also a realist. No one has the magic formula for startup. No one. It’s very Catch-22 that the most successful founders are the ones who least need free labor. There’s a reason for that. While the idea and the founder are somewhat static risks, the last risk, the process to get the idea to successful product, is one that needs continuous mitigation. This is where Chad is losing the motivation and the productivity of his volunteers. They’re losing faith in the process. From the very first pitch to the prospective free employee to the moment we cut them their first salary check, we need to sell them on the idea that the process will work. There’s a right way and a wrong way to do that, and if we take advantage of people, it’s going to come back on us. The wrong way can lead to the incredible scamminess we’ll find in something like Fyre Fest or Theranos. (Most) People wanted those things to succeed for the right reasons: For the former, an immersive and interactive social experience, and for the latter, inexpensive and less-invasive blood testing. The founders then preyed on those ideals to obtain products, services, and money with zero or deferred remuneration. This isn’t every startup, obviously, but the bullet points are there. What happens is vague promises get made. Then inevitably one party claims those promises got broken while the other party either parses the promise or denies the promise ever got made. The right way to employ free labor is with transparency and on a timeline. Transparency happens in writing, explaining what the expectations are for their output and how much time we need from them on a weekly basis. We should also be clear about where they fit in the company’s eventual hierarchy. Are they a co-founder? Are they a C-Suite employee? Will they be? A clear definition of the value of any non-cash compensation as described above is also a must. And then finally it should be noted how much money the founder has or has access to and what that money is going to be used for. A timeline should be laid out that explains, at a minimum, the events that need to happen for the employee to start getting paid, what kind of schedule might be used to get that pay up to something decent, and how long we believe it might take. Never make it indefinite because when we do that we’re putting the employee on a short runway alone. We need to be on that runway as well. If we can’t pay them within, say, six months, then we need to fold up and go home. And a word of warning — when I say we need to fold up and go home, we can’t pause and start over. Imagine what happens when we lay off our free labor and then we do succeed. Those people we cut out have a case against us, and believe me they will make that case. So what does Chad do here? Is it possible for him to retroactively apply what we’ve laid out here and take this transparency and timeline to each of his volunteers and get them to re-up? Absolutely it’s possible. That’s what leadership is. And I daresay that’s what’s missing. He’ll lose a bunch of them, for sure, but at this point, it’s the only right way to move his company forward unless he’s prepared to start paying everyone today.